But what really made me love the movie was the core concept behind it – whether or not people can be reprogrammed to deny their natural desires. The title gives this away, as it refers to something organic and natural being turned into a machine. Free will subjugated for the greater good of society. 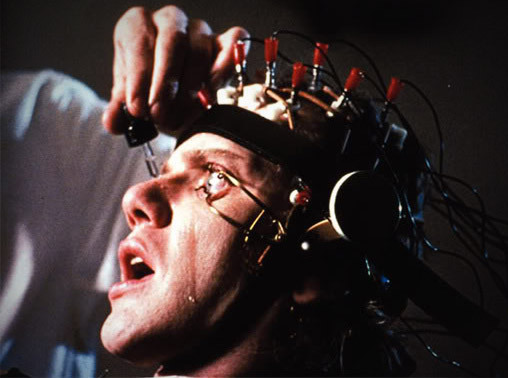 In the case of the ultra-violent Alex in A Clockwork Orange, this happens when he’s subjected to the Ludovico technique, where he’s shown violent imagery until it cripples him with nausea when he has thoughts of violence or unleashing his predatory sexual desires. In the case of beer, there’s a much more subtle and pleasant form of reprogramming available – Terrapin’s Big Vladdy Daddy Russian Imperial Stout. Simply put, Terrapin Big Vladdy Daddy is the best example of a “gateway” Russian imperial stout I’ve ever come across. It’s a great way to introduce people to the wonders of dark beer and reprogram their desire to avoid it, you know, for the greater good – MY greater good. More dark beer lovers = more dark beer sales = more dark beers on the shelf = happy Jim. And trust me, this is an issue that must be addressed! Overall, this is a fantastic beer for the noob and nerd alike. It pours like you’d expect, dark as night with a thin tan head. The nose is dominated by the rich and smoky aromas of coffee, bitter chocolate and roasted malt. The first sip is surprisingly light in the mouth, and the beer has all the common flavor characteristics of a classic imperial stout like chocolate, coffee, and toffee. But it also has an uncommon smoothness and sweetness that makes it an easy beer to enjoy. You’d never guess this puppy is packing a 10.5% ABV. It doesn’t challenge or overwhelm you, it simply shows you what a treat an imperial stout can be. I wasn’t into IPA’s at all until I tried a Stone IPA, then I “got” it and my palate learned to appreciate and crave that style of beer. 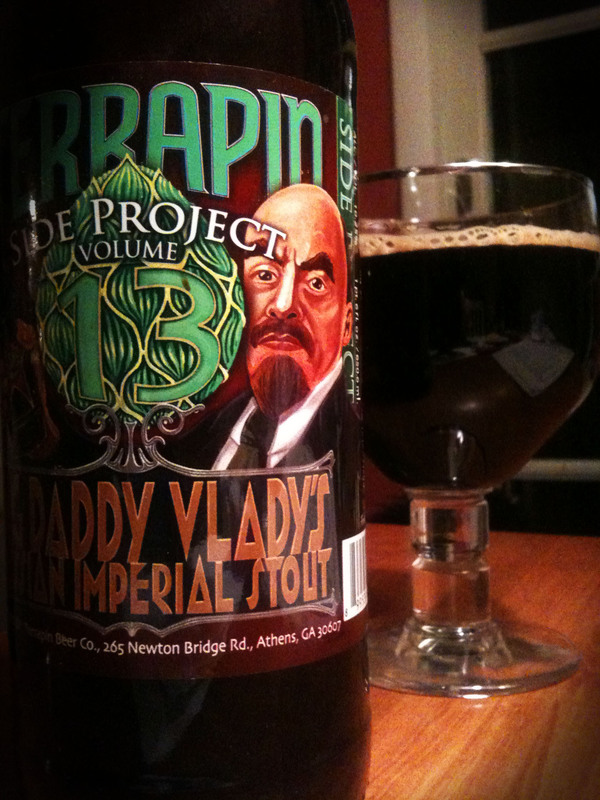 If you haven’t had a lot of luck with stouts, Terrapin’s Big Vladdy Daddy could be your way in to the style. The question is will you seek one out yourself, or will we have to strap you into a chair and administer the Vlad-ovico technique? For me, this is the RIS that should be left behind on the shelf for your mass consumption. It has all the flavors you said, but the aggressive hot alcoholic burn and annoyingness was tough to swallow. Intersting, Rob. It did warm the chest for sure, but it didn’t overpower the flavor or the nose for me. I think the flavor is good for the RIS noob, but perhaps the physical sensation of alcohol is something they’re not prepared for. Good looking out. I recently tried Yuengling’s Black and Tan, and now I am a lot less scared of the dark. Not to say I am quite ready to go RIS, but in time, I’m pretty sure I will be. I liked the B&T enough to try the Dark Ale from my favorite local brewer (New Albanian) at lunch today, and it was easily as good, if not better than the Yuengling, imo. Also, I recently “got” it, in regards to Pale Ales, when I sampled a few last weekend. Sierra Nevada PA, Goose Island IPA, and Shlafly APA, and I really liked them all. Sounds like you’re on your way. I like how you’re baby stepping so you don’t shock your palate. Very smart and a fun journey you only take once. until you discover whiskey!